Backpacks have become an inseparable item in the busy life styles of people thanks to the hands free convenience and the load bearing capacity that these bags offer. Though zipper backpacks may be the most popular among school bags, drawstring backpacks score a few brownie points for being more tear resistant and beautiful. 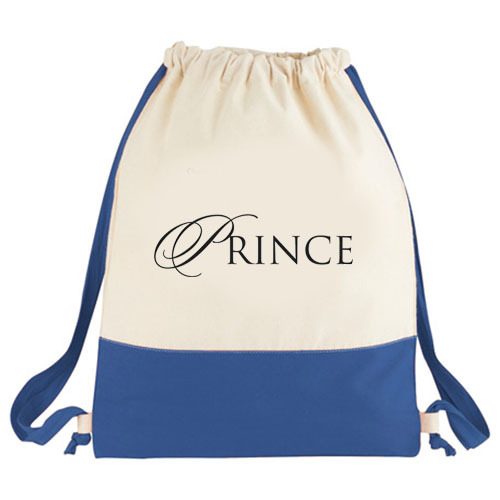 Drawstring backpacks are simple and easy grab on the go type bags sans the hassles of zippers and clips. Backpacks are available in a range of brilliant colors, which enhances its casual charm and appeal. The single compartment design will enable the user to stuff in all their essentials while the drawstring closure will ensure a tight and secure fastening. The simple open and close mechanism is what makes these custom bags really special. Any backpack’s main attribute is its functional features rather than its design and drawstring bags gets the highest score in this department. It is a perfect option for quick packing for a day out at the gym or the beach. Available in various materials like nonwoven polypropylene, cotton or polyester, drawstring bags are more durable than the zipper back pack. For this same reason, it is convenient to pack in even a pair of sneakers or gym outfit without risking wearing out the bag. In most parts of the world, school children like to use drawstring back packs to carry their books, class room supplies or even sports or gym apparels. The best part is that these bags are available in a range of sizes and models that range from small models to large and heavy duty models and everything that falls in between. 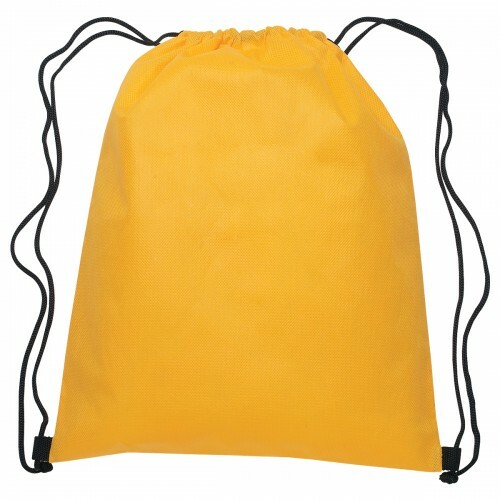 The drawstring backpack is generally smaller and flexible than a regular zipper back pack, which means that it can be easily tucked under the desk or in a school locker. 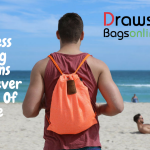 The Drawstring backpack is a perfect choice for people on the move who need a bag that can be packed easily. 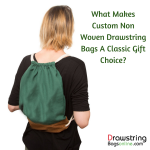 The simple single compartment design will make it easy to stuff things while the handy string can be used to carry it over the shoulder as a sling bag or as a backpack for those who wish to ensure an even distribution of load. 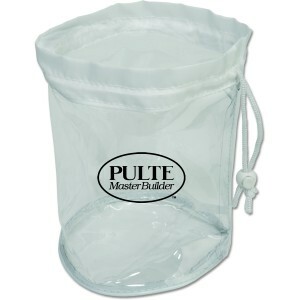 Small Clear Mesh Drawstring Bags: These transparent drawstring bags are perfect options for a day out in the sports stadium or on the beach. The clear design will let your recipients see their stuff easily and will save a lot of effort and time in finding it. 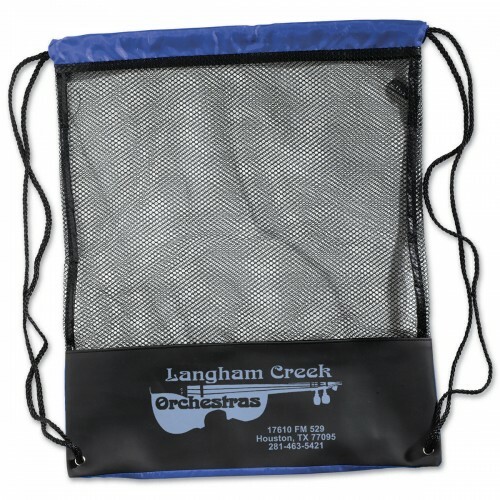 This drawstring bag also offers clear visibility to your business message and it often remains customer favorite due to their easy manageability. 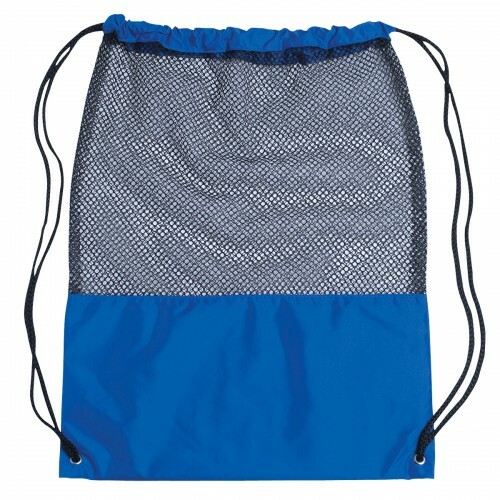 Mesh Sports Drawstring Bags: Custom imprinted mesh sports drawstring bags make a perfect choice for sports players. The large storage space and the simple design will make these sling bags hugely popular to carry their sports items easily. The mesh design will help the users to carry their used or wet clothes and shoes. These bags can be personalized to promote sports supply stores and sporting events. 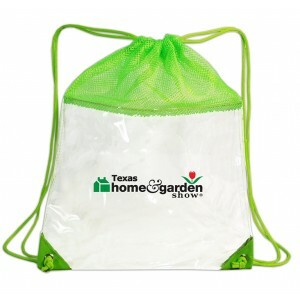 Available in different color choices, these drawstring bags will make your brand highly portable and visible. Split Decision Cotton Cinch Bags These good looking cinch bags are perfect for any outing and special occasion. 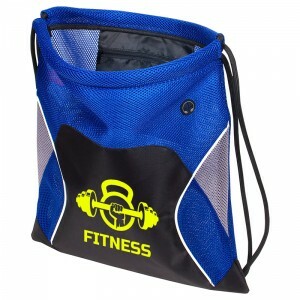 This cinch bag will make an impressive business handout for new members in sports clubs or gym. Need more? Browse our collection and we bet, you cannot buy just one!